Are You A Veteran? Find out if you qualify for a $0 down home purchase! Our Shasta County websites features the best real estate search for homes, condos, land and foreclosure properties throughout the area. It is the only site you will ever need- it is easy-to-use, and updated by the official Realtor’s database every 15 minutes. Save your favorite searches, and get notified about new listings, price changes, sold data, and market reports. Our Interactive Map Search allows you to view properties on a map or refine your search by drawing the boundaries around the area you desire. Curious about what’s happening in your Shasta County neighborhood? You can create a custom market report to see what’s active, under contract, and sold in your neighborhood! Considering selling or refinancing your home? Get an INSTANT property valuation now! Your home value report is sent directly to your email. It includes detailed information about the prices of comparable homes, recent pricing trends, and more. Al Naticchioni welcomes you to Residential and Commercial Real Estate in Northern California. He and his wife (Pat) are the Brokers/Owners of RE/MAX of Redding, a full service real estate brokerage firm. An extensive education achieving Designations (noted below) in a broad spectrum of the Real Estate Industry; added to years of “in the trenches” experience, makes Al one of the most qualified Real Estate Professionals in the North State. With mountains all round, miles of winding hiking and biking trails, a river running through the middle of town, and a plethora of nearby national parks, Redding is a nature lover's paradise that appeals to all ages. With an average of over 300 sunny days per year, Redding is a great place to escape the chill of winter months. 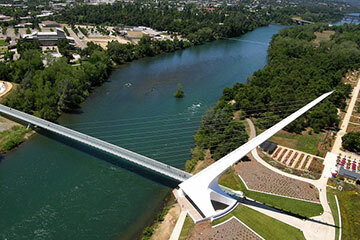 Additionally, Redding is home to the famous Sundial Bridge, world-class fishing, and so much more. It's an ideal vacation destination, and even more, it's an ideal place to call home. Amazing lifestyle opportunities abound in these highly sought after Shasta County Neighborhoods. Al Naticchioni welcomes you to Residential and Commercial Real Estate in Northern California. He and his wife, Pat, are the founders of RE/MAX of Redding, a full service real estate brokerage firm. With an extensive education in a broad spectrum of the Real Estate Industry; added to years of “in the trenches” experience, Al is one of the most qualified Real Estate Professionals in the North State. Nice level lot zone General Commercial. Lot is corner lot with frontage on 3 streets Lake Blvd, Santa Rosa, and Lake Forest.